What started 10 years ago as an event to make citizens more aware of energy assistance has grown into a community event helping Talbot County’s community members learn more about the agencies and services available to assist them with a wide variety of needs. The Talbot County Community Resource Expo, hosted by the Neighborhood Service Center, will be held on Saturday, April 6 from 9 a.m. to 1 p.m. at the Easton Elementary Moton Building, located at 307 Glenwood Avenue in Easton. 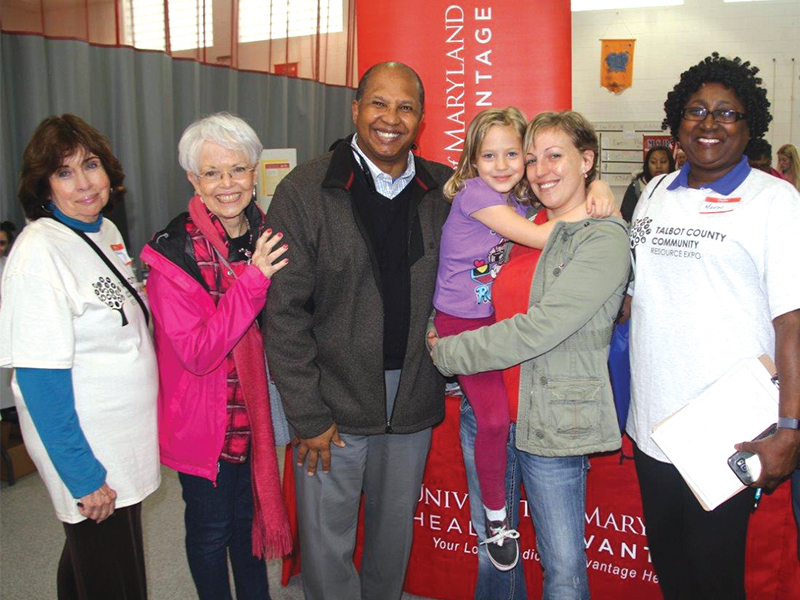 Catherine Poe (left), Addie Eckardt, Corey Pack, Sophia Smith, Jamie Longworth (NSC client), Marilyn Neal and attended the Neighborhood Service Center’s 2018 Resource Expo. Along with Choptank Electric Cooperative, Delmarva Power, and Easton Utilities, the event’s partners include Talbot County Government, Talbot County Public Schools, Talbot Family Network, Talbot County Department of Social Services, Shore United Bank, Talbot Hunger Coalition, Women Infants and Children (WIC), Kappa Theta Omega-Alpha Kappa Alpha Sorority, Talbot County Free Library, and Talbot County Detention Center. Last year’s event, which was multi-generational, drew 250 families. Since the expo, the Neighborhood Service Center has experienced a 13.9 percent increase in demand for overall services. The center, which serves as Talbot County’s community action agency, administers Maryland Energy Assistance Program (MEAP). The expo grew out of the center’s need to educate the public about energy assistance programs. Community action agencies, local private and public non-profit organizations, were formed all over the country beginning in 1965 to address the needs of low-income residents and to carry out the Community Action Program (CAP), which was founded by the 1964 Economic Opportunity Act as part of the War on Poverty. President Lyndon B. Johnson proposed this legislation in response to a national poverty rate of around 19 percent. Funding to the agencies comes through Community Services Block Grants. The Neighborhood Service Center has been serving the low-income residents of Talbot County since 1969 as a 501(c)3. Requests for services have increased in every area over the 49 years the Neighborhood Service Center has been operating in the county. This year’s free event will provide onsite services to include energy assistance, medical exams and health screenings, haircuts, identification, financial literacy, education resources, childcare, mental health services, vision screenings, dental care, school registrations, prescription medicine, food, health services, housing, transportation, disability services, and job placement, as well as navigators, including Spanish speaking navigators, to help participants with locating the appropriate services. Lunch is provided and limited transportation is available. The center’s Emergency Assistance Program offers nutritional drinks, car repairs, assistance with funeral expenses, and even gas assistance for cancer patients traveling for treatment. This program is funded through the Talbot County Council, the United Fund of Talbot County and individual donations. For school registration at the expo, children are required to have an up-to-date immunization record, a birth certificate (proof of custody), a social security card, and proof of current grade. Parents/legal guardians are required to have ID income verification (pre-K only) and proof of residency. Registrants also need to bring two of the following: driver’s license, W2 form, bank statement, voter registration card, pay stub, or income tax return. The Resource Expo is asking for donations of personal hygiene and household cleaning items, kitchen items, and diapers and wipes to give out during the expo. These items are not covered by Food Stamps and are needed by those who attend. For further information or to donate items, contact Tonet Cuffee or Cardeaner Robinson, Director of MEAP, at 410-763-6745 or 410-763-6746. Interested persons can also visit nsctalbotmd.org to make donations online or send donations to the Neighborhood Service Center, located at 126 Port Street in Easton.